The result is a ghatam, eight kilograms of mud that make beautiful music. “You have to beat it 3,000 times,” said Meenakshi. And she sets about doing just that. "It" is an unfired clay pot that looks like many others used in cooking. This one, though, she will shape into an earthenware percussion instrument. Placing it on her lap, she starts slapping the sides with a big wooden spatula. When completed, the pot will be a ghatam, a high-quality musical instrument commonly used in south Indian Carnatic concerts. Meenakshi Kesavan is an expert ghatam maker. The 63-year-old and her family could be the only ones producing the unique type she specialises in – the manamadurai. “The tricky part is tempering the ghatam to improve the tone,” Meenakshi explains, whacking the sides with her right hand. With her left, she rotates a round stone inside the pot. “That’s to see the wall does not collapse. And to make it smooth,” she said, pausing for a brief rest. After four decades of moulding mud, her hands hurt all the time. She explains how the pain shoots down from her exhausted shoulders to her fingertips. But a minute later, picks up the wood and stone and adjusts the pot on her lap. The beating resumes. Meenakshi beating a ghatam (left). She holds up the round stone used inside the pot to smoothen the walls (right). Meenakshi with the Akademi award (right) and the framed photograph of her receiving it from the President of India (left). Ramesh makes it seem effortless. He sits in front of the electric wheel, pats a lump of clay and places it on the centre. As it turns, he quickly draws up the clay and shapes it with his hands. When ready, the pot is "finished" by beating its sides. At this point, the raw claypots that Meenakshi works with weigh a whopping 16-kg each. For the next couple of weeks, the ghatams are dried in the shade and then warmed for four hours under a fierce sun. Finally, the family applies yellow and red polishes to the pots and fire them in the community kiln for 12 hours. They shed half their weight when baked. The result is 8-kg of mud that make beautiful music. Ramesh turns the electric wheel (left), draws up the clay and shapes it (right). Ghatam-making has seen many changes over the years. The pots now tend to be as players prefer them – lighter, smaller, more elegant. “They’re easier to carry about,” Ramesh points out. Manamadurai ghatams are still the heaviest variety. They weigh thrice as much as a cooking pot, and are at least twice as thick. Chennai and Bengaluru produce lighter, thinner ones. Technique apart, the clay from the Manamadurai region deserves some credit for the excellent clarity. Sadly, the best soil now goes into making bricks, affecting the potters’ livelihood. Yet, Ramesh is happy to teach his daughters, nephew and niece – the family’s fifth generation – to make ghatams. It isn’t the money. Ghatams fetch them “a mere six hundred rupees a piece". Compare this with a small, luxury brand, bone china bowl that costs a few thousands. Ramesh lifts the raw clay plot from the wheel and carries it indoors. Young Ramesh was taught by his 90-year-old grandfather who “continued working until a couple of days before he died". 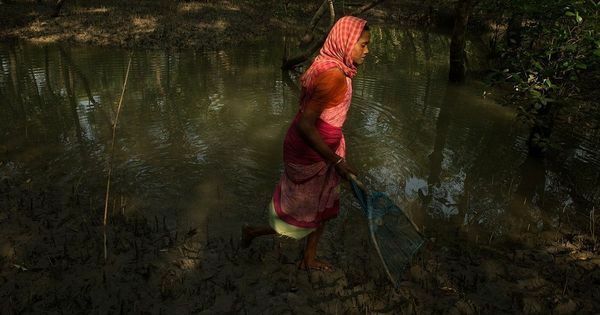 Meenakshi chips in to say that her father-in-law had lived long because he never allowed anybody to photograph him. I put away my camera guiltily. She accepts the poor returns, seeing her work simply as service to music. For long an accompanying instrument, solo ghatam recitals are now not uncommon. She has attended a couple in which her ghatams were played. Ramesh tells me the details. His mother is not very chatty. Interviews with her after the Akademi award noted she was reluctant to speak about herself. “The first long interview she gave was on All India Radio last year. She even spoke about the kozhambu [gravy] that my father liked,” Ramesh laughs. The little she tells me is about business. Ghatams are not their mainstay. 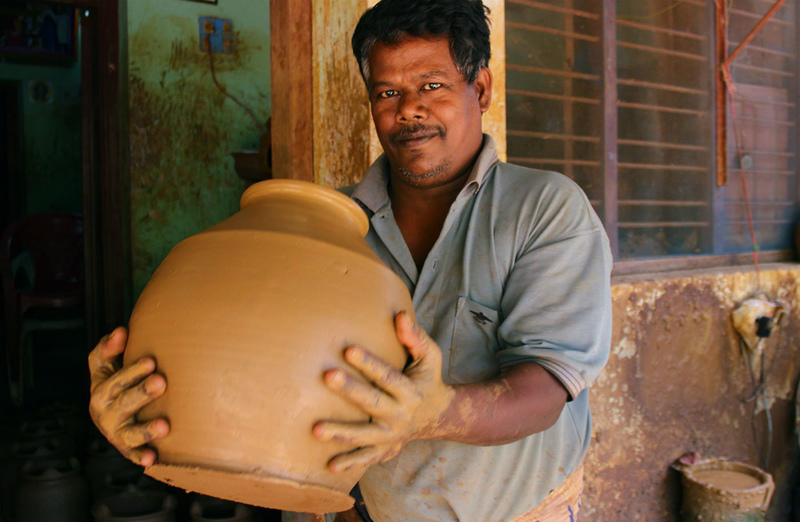 Their regular income is from a wide selection of earthenware, including pots to brew Siddha medicine. In a full year, Meenakshi, Ramesh, his wife Mohana, and his sister K Parameshwari, along with a few helpers, make about 400 ghatams. Just over half of these can be sold, the rest fail the tone test. That can be done only after the pots are fired. Sometimes, the best looking ones are unfit for music. “There is no financial help in this business. Governments do not patronise the craft. And unlike players, we are not encouraged with awards,” rues Ramesh. But he’s proud that, despite the odds, his family provides a livelihood for several people. The day we visit, the workforce is out in the drizzly yard, moving the half-dried pots indoors. The rooms are stacked high with terracotta. The sky, sulky and rumbling, promises a wet afternoon. Monsoon is a wretched season, they grumble. His work disrupted, Ramesh moodily plays a ghatam. His feet and hands are the colour of sandalwood, freshly smeared with clay. He taps his fingers near the pot’s mouth, producing a sharp, metallic sound. “I’m not formally trained,” he said, but clearly has a terrific ear for rhythm. Many percussion instruments use animal skins. Only ghatams are created from the five elements. There’s clay from the earth, the sun and air to dry it. Water shapes it, and fire bakes it. Ramesh does not mention human labour. He doesn’t have to. Because from inside the corridor, all we hear is Meenakshi beating a ghatam until its sides are smooth and its pitch perfect. 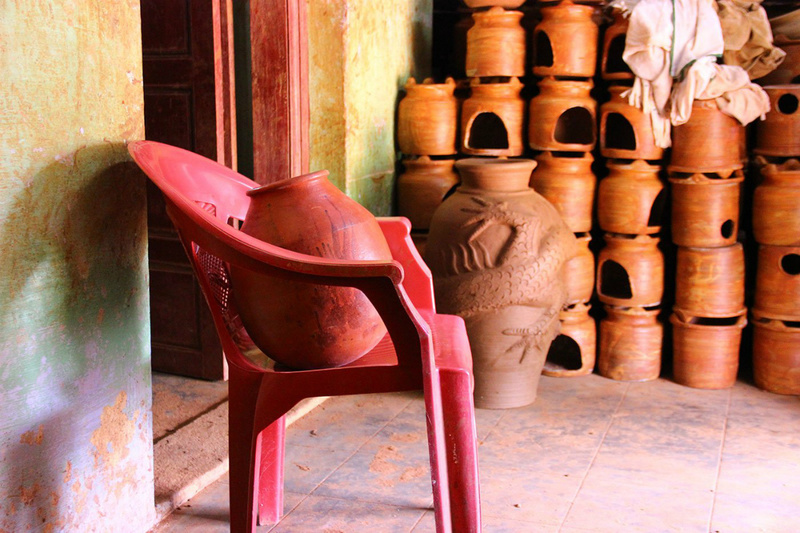 The house is stacked high with terracotta; only the ghatam is seated on a plastic chair. This article first appeared on People's Archive of Rural India.